I’ve always liked planeswalker cards, even when other people were wary of their novelty or tired of their dominance in Standard. I’ve always liked Elspeth, too, and that’s not just because of her regal beauty and stylish armor (although that is obviously part of it). She happens to play great, too. Where most planeswalkers would have a minus loyalty ability, hers keeps going up even as she has a powerful and growing impact on the table. That made her absolutely unique at the time and still eye-catching now. Even the turn she comes into play, she’s started at least one race against time (the extra damage, and/or the countdown to her ultimate), and made it harder to attack her in at least one of two ways (the new blocker and/or the need to split resources between the boosted attacks and Elspeth herself). It’s no wonder that people actually speculated whether she should be banned in Shards of Alara Block Constructed: while no one of her abilities (aside perhaps from her ultimate) is particularly unusual in itself, they add up to the ability to dominate almost any game state. Heliod was right to fear her, and I pray that one day he finds out exactly what she’s capable of . . . While she has since fallen from prominence a bit, there was a period of time where Elspeth, Knight-Errant was considered the second-strongest planeswalker ever printed…behind only the infamous Jace, the Mind Sculptor from Worldwake. Ajani Vengeant wound up getting more attention than Elspeth, since the angry kitty is far more direct about how it would like to remove faces, but Elspeth’s more-subtle power has still stood the test of time. 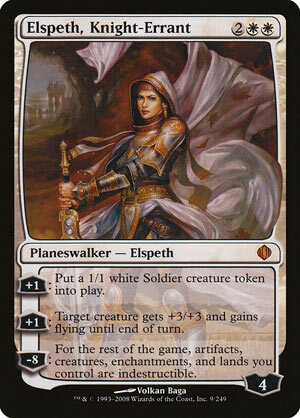 In fact, when the Guilds of Ravnica Mythic Edition came out, this was the Elspeth to get the masterpiece treatment. At first glance, she doesn’t seem like a lot: pump a creature and give it flying, or make a soldier. But both of these are +1 abilities, which means you get to pick your “poison”, so to speak, en route to her potent ultimate…which can and will put a game nearly out of reach for your opponents when most of their answers simply do not work. 5 loyalty is a lot to try and whittle away the turn after she comes down, and she is able to protect herself with a stream of soldiers. She also can end the game with a timely pump spell, making her a rare planeswalker that can just break a stalemate as soon as she resolves. Elspeth may not be the second-strongest planeswalker in today’s Magic, but she still stands as one of the more generally-powerful exemplars of the card type. That you can still discuss her potential status that way speaks to how powerful she was, and is, on-release.